22 January 2010 - 2 days are what we called a trip? Went to KL for some fast shopping with my family since my dad had to attend some sort of business meeting. 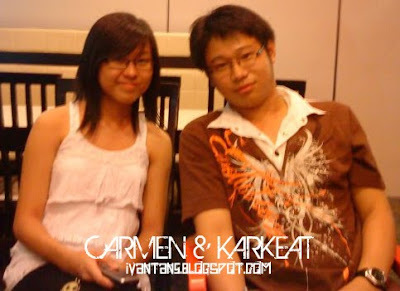 These are the photos taken at 1Utama. Frankly speaking, Ipoh really need to catch up on the decorations for festivals. After that, my mom, aunt and my sis were busy shopping for clothes and those kind of stuff. Photos below are taken for Miss S with her S shirt. I realised I'm hooked up with photography nowadays. Around the time stated in the photo below, we went to Wong Kok Restaurant for lunch. 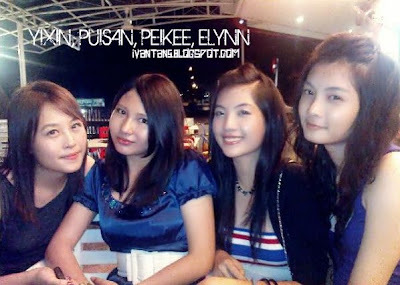 13 January 2010 - Went to Sky Corner at Ipoh Garden East on this day. It was because on one fine day Yixin suddenly sms me and said that there will be a gathering for primary class. The last reunion I went was 2 years ago. My first reaction was like erhm... because some friends are working whereas some went to NS so there will be less people compared to last time. At first I can't make it due to time constrain and transport problem because 7pm was the time I went back to home after a tiring work. 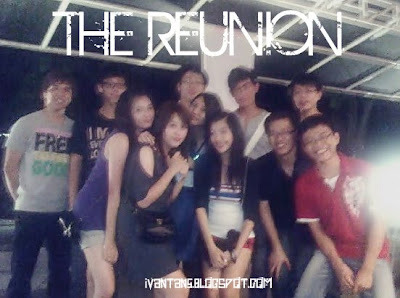 For me, I was quite happy cause can meet up my former classmates. Even some of the faces I've forgotten. Eat, eat, eat, drink and talk~ That's what we did there. Those who present were Me myself, Bing Loon, Sheng Rong, Lip Sin, Kar Keat, Boon Hong, Chee Kuen, Woei Hong, Hoe Nam, Yi Xin, Elynn, Pui San, Pei Kee, Tweedy, Carmen. I think that's all. Where are the rest? 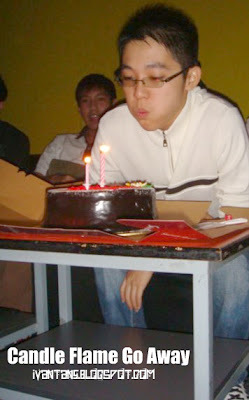 11 January 2010 - Today is Eon Chen's birthday but we celebrated it yesterday @ Kbox. 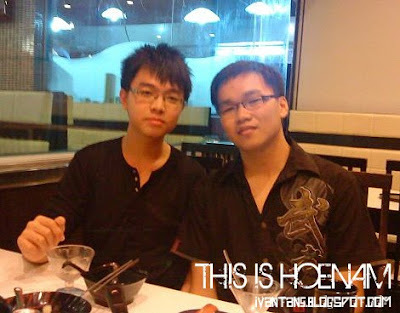 Those who absent were Vincent and Chuah because they are so unfortunate to go to NS. Esther's birthday falls on 12 January too. So some of us besides buying Eon's presents also getting Esther's some small gifts. 5 hours non-stop inside the room makes most of us sufferred sore throat and leave us voiceless at the end. Pui San and Esther went in for quite some time and left early. 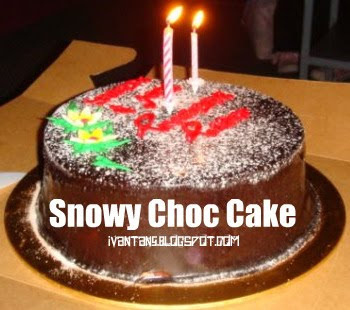 I heard from Yee Lim that this cake was bought by Pui San and Chuah. How the hell did Chuah shared with her to buy it? A piece of cake equals to a chicken rice - by Nike Phang. I wonder what he means... The birthday boy blowing the candle. Luckily I managed to snap it right on time. =) Eon said some of the pictures actually have white dots on it which makes him believe that the dots are those spirit or ghost or whatever you call it. Haiz, I do admit that he is quite superstitious sometimes. A slight abnormality or unusual things that are out of the picture will make him energetic for some time. I tried to convince him that those are just flash lights from the projector but it seemed that my words have fallen into deaf ears. =_='' For more of those pictures, please go to his profile and look for it yourself. This is the one I mentioned earlier. 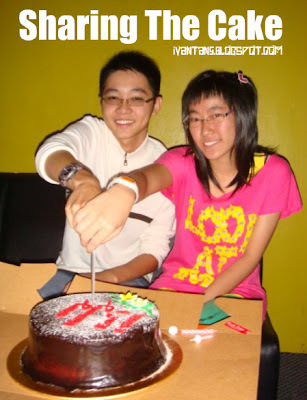 They shared the cake since the gap between their brithdays is just 24 hours. 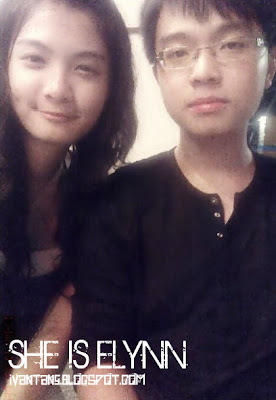 Yee Lim said they look like couple whereas Alan said they have the brother-sister look. That's all for this post. 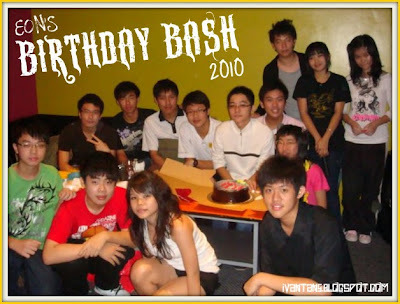 Not forgetting to wish my dear friend, Eon Chen.. He will be going to Singapore soon.